Ever since my Mom sent me off to college so many moons ago, I’ve been trying to replicate a stuffing recipe that is as delicious as hers. I don’t know if it’s because her stuffing is just totally and completely magically delicious… or if it’s because it’s made by MOM. It might be a little of both! The stuffing recipe I’m sharing with you today has a whole bunch of deliciousness in it too. I added some of my favorite things: shallots, butternut squash and cranberries. Those things give it plenty of flavor, they make it more interesting than your average stuffing, and they make it quite pretty to look at too! I created this recipe for Eggland’s Best, which I totally loved doing since these are the eggs I buy every single week for my family. 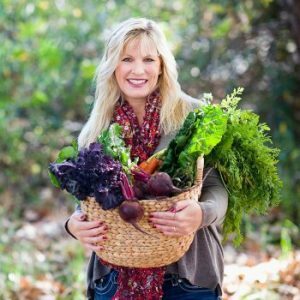 I love this recipe because you can prepare the whole thing the night before you plan to serve it! We’re scrambled egg and hard-boiled egg fanatics in my house, so I am in tune with wanting to keep the good brands on hand in my fridge. 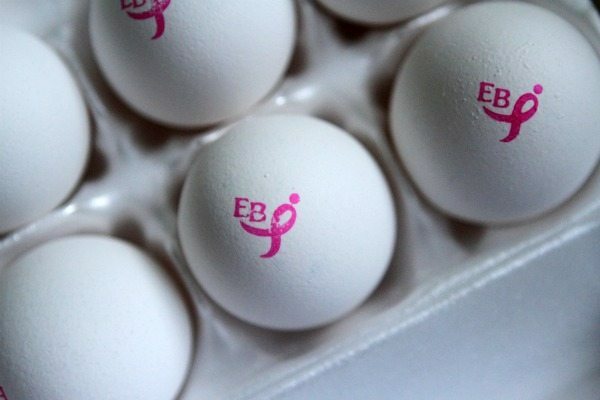 Compared to ordinary eggs, Eggland’s Best eggs have four times more vitamin D and 25% less saturated fat. Their eggs stay fresher longer than ordinary eggs, which is important when you’re making so many delicious meals for your family and friends during the holidays. There are four eggs added to the chicken broth in this recipe to create the soaking liquid for the bread in the stuffing. And there it goes – partnering with the bread to do the business of soaking. Some fresh Italian parsley is added in the end. Here’s the fun part: at this point, you take “clean” hands and mix it all together. It’s really the best way to do it since a spoon doesn’t get all the nooks and crannies of the bowl. The stuffing is stuffed into your casserole dish and covered with foil, then it’s refrigerated until you’re ready to bake it. An hour is fine, and overnight is cool too! Oh yes, there it is all baked and yummy. The bread pieces are lightly crisped on top, and the bread underneath is properly moistened and soft. This stuffing was met with great enthusiasm by my family. I even got my 13-year old to eat butternut squash- yay! I’m going to call it a hit-out-of-the-park, grand-slam stuffing recipe. The sausage and fresh herbs helped boost the flavor, the butternut squash + other vegetables and Eggland’s Best eggs added to the nutritional value, and the dried cranberries added a pop of sweetness. 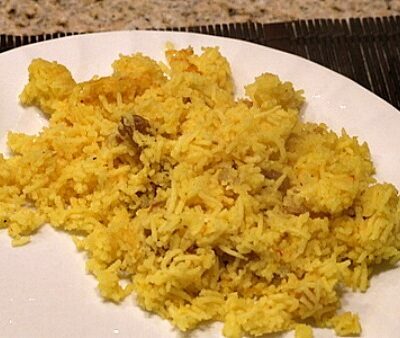 How does it compare to my Mom’s recipe? Well, since it’s so much different than her recipe, I’m going to have to declare them two separate dishes. They’re equally delicious! P.S. 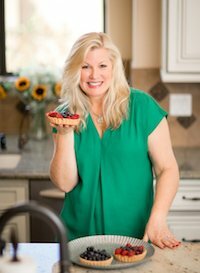 I don’t have a recipe for my Mom’s stuffing on my site since she’s a throw-a-little-of-this-and-a-little-of-that in kind of cook! 1. 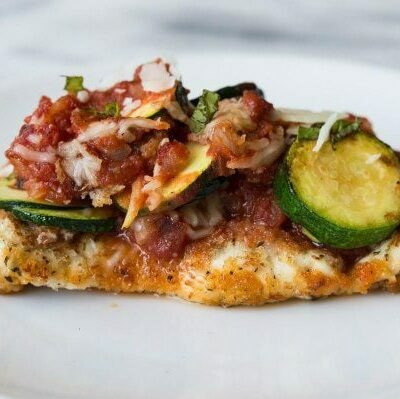 Preheat the oven to 375 degrees F. Spray a 9x13-inch baking dish with nonstick spray. On a large, rimmed baking sheet, bake the bread for about 15 minutes- or just until it is toasted and slightly golden. Let cool, then transfer to a large bowl. 2. Heat a large skillet over medium-high heat. Spray with nonstick spray and add the sausage to the skillet. Use a spatula to break up the sausage into crumbles as it cooks. Cook until no longer pink. Scrape the sausage and drippings into the bowl with the bread. 3. In the same skillet, melt the butter over medium-high heat. Add the mushrooms, butternut squash, shallots, celery and salt. Stir often while cooking- until the vegetables are softened (about 10 minutes). Stir in the garlic, sage, rosemary and red pepper; cook, stirring for about 1 more minute. Add the wine and continue to simmer until the vegetables have absorbed most of the wine. Scrape the vegetables and all of the juices into the bowl with the bread and the sausage. 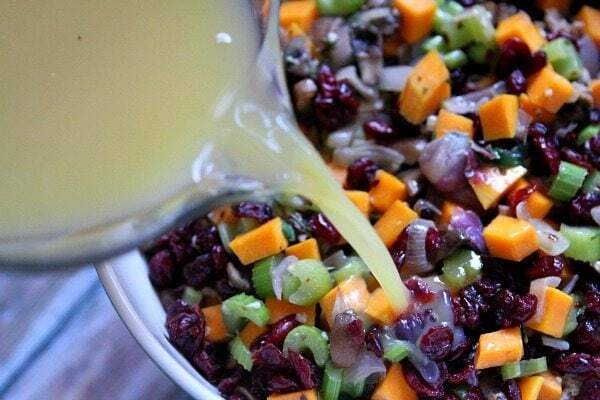 Sprinkle in the dried cranberries. 4. In medium bowl, whisk together 2 1/2 cups of the chicken broth, eggs, remaining 1 1/2 teaspoons salt and pepper. Pour it into the bowl with the stuffing ingredients. 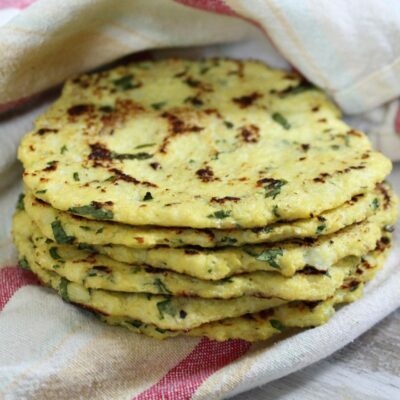 Sprinkle parsley on top. Use clean hands to toss the stuffing with the liquid. You want the bread to soak up as much as possible. Scrape the stuffing and any juices into the prepared pan and create an even layer. Drizzle the remaining 1/2 cup of chicken broth on top. Cover the pan with foil and refrigerate for at least one hour (and it's okay to refrigerate it overnight too). 5. When ready to bake, preheat the oven to 375 degrees F. Let the stuffing sit at room temperature for at least 20 minutes. Bake, covered, for 30 minutes. Remove the foil and bake for an additional 30 minutes, or until the bread pieces are looking golden and crisp on top. Serve warm! 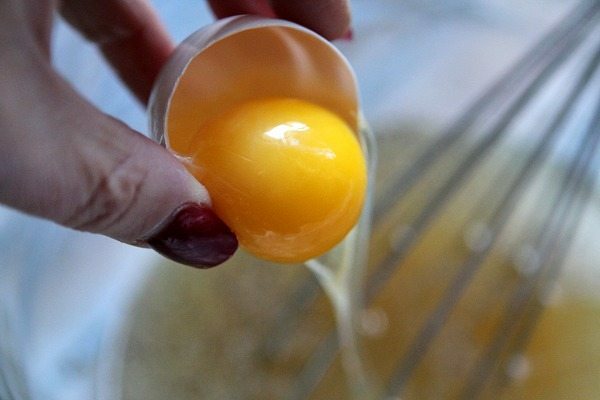 Disclosure: This post has been written in partnership with Eggland’s Best, a product that I use every day in my kitchen. All opinions shared are my own. 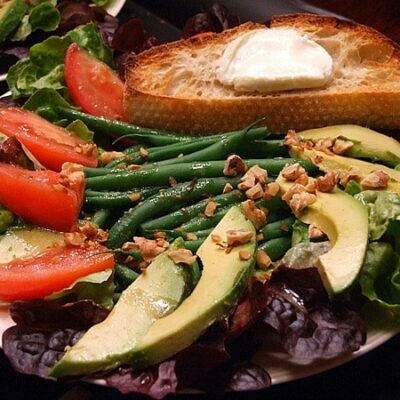 For more recipes using Eggland’s Best, visit their website. You can also follow them on Facebook, Twitter and Pinterest. Am going to make this without the butternut squash in it but rather use the recipe to stuff the squash…and I am going to use a maple sausage. Will let you know how it turns out. Thanks for the recipe…it sounds amazing. Oh yeah…and only half with mushrooms even though I love them, my dad and one daughter do not. I love all of the colors and textures in this stuffing! 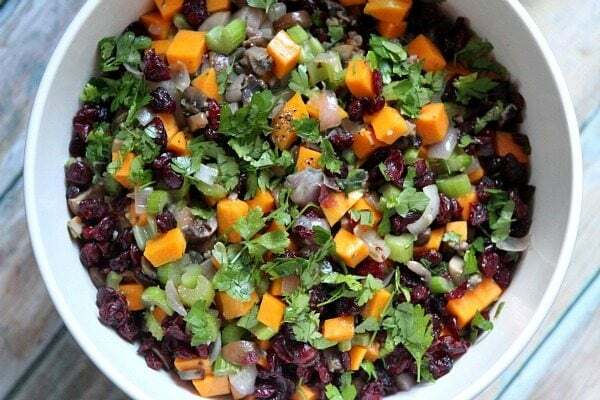 I love the combination of the butternut squash and cranberries. And Egglands – the best! There is so much going on in this post that I love! I agree, certain things made by Mom just taste better. I’d be a happy girl with this stuffing! And Eggland’s best is my egg of choice too. And I have to say, that casserole dish is beautiful! I hear you on Mom’s stuffing. My mom’s stuffing is so basic yet so good. I love how fall this feels with the butternut squash and stuffing. 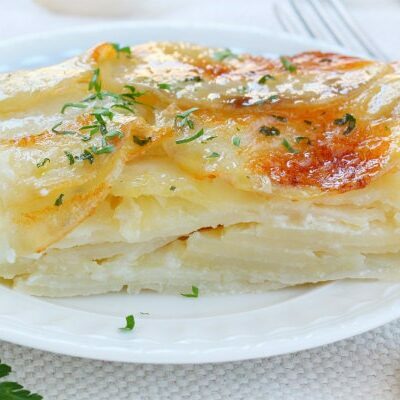 Forget Thanksgiving – I’d make this for a normal dinner side dish. 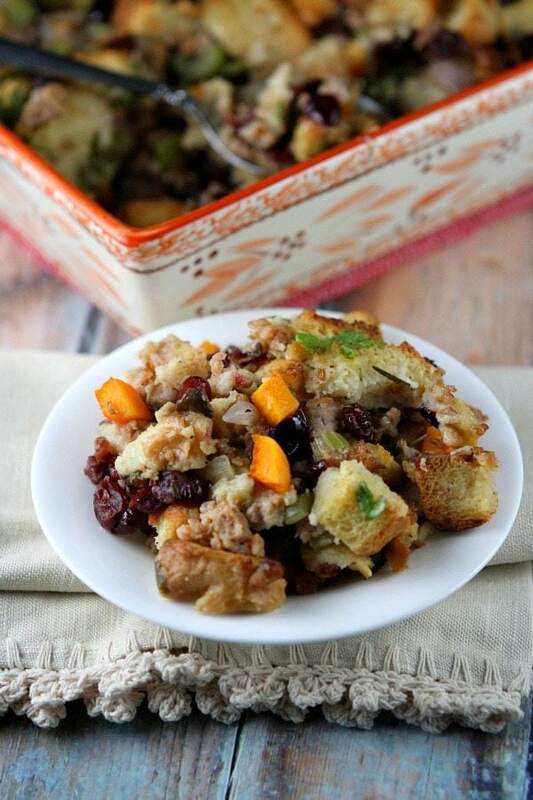 Adore your crazy stuffing! 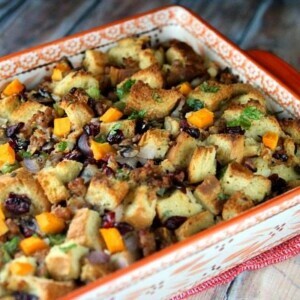 I love to try new stuffing recipes, so I have this on my list this year! Love the addition of that butternut squash and I’m obsessed with that serving dish!! Oh I love the flavors in this Lori! This is perfecto! I feel the same way about my dad’s stuffing…I can never get enough at Thanksgiving! 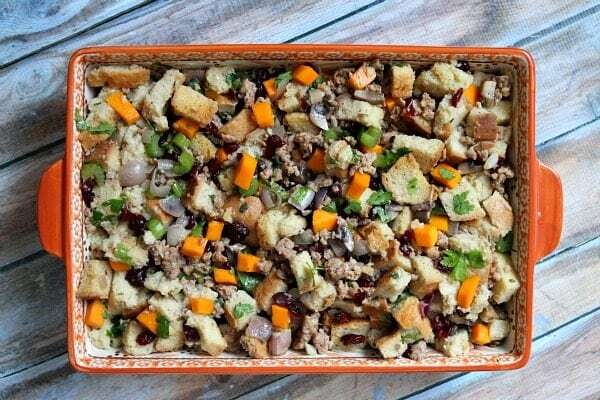 This colorful stuffing looks so darn good! Haha yeah, we definitely have always called it “stuffing” too, even though it never sees the inside of the turkey. This STUFFING is about a million times prettier than any other variety I’ve seen. I love all the goodies in there. It’s like a veggie side dish and stuffing, all in one! 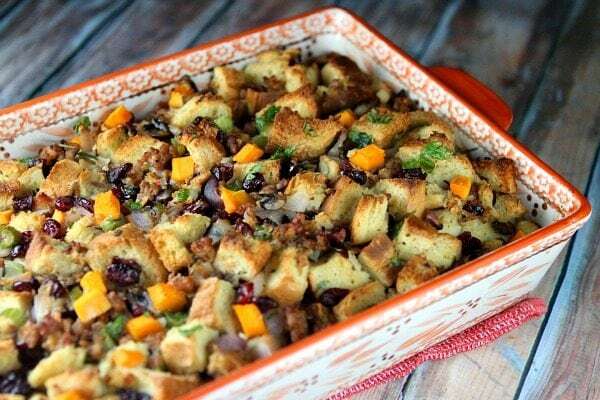 This stuffing sounds fantastic! 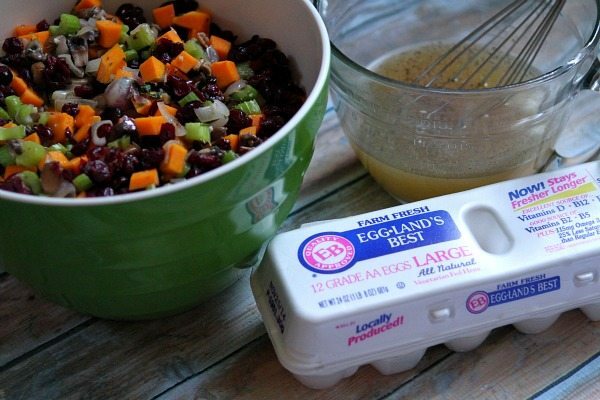 Love that you used squash and cranberries! So good! I love Eggland’s Best Eggs and this stuffing sounds amazing. I love the addition of the butternut squash and it is really gorgeous. 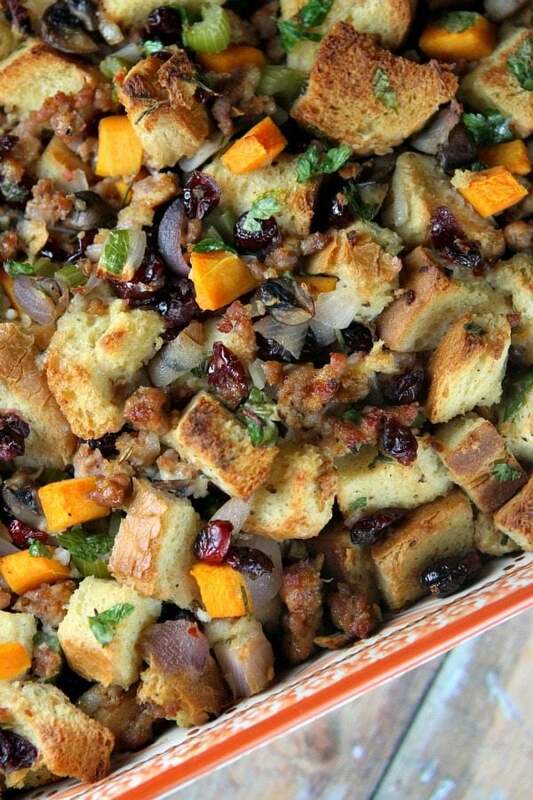 This is my kind of stuffing — love how colorful it is! 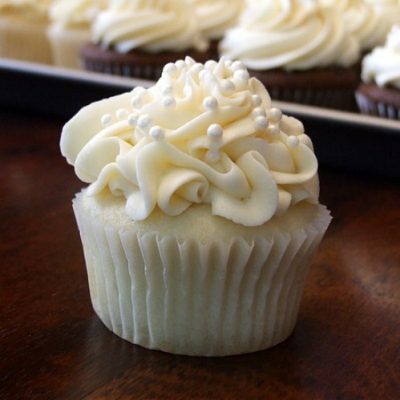 Would love to sample both yours and your moms recipes, both seem so delicious. Great that your 13-year-old ate the butternut squash in this dish – that is so the way to go. Love it when my kids eat dishes loaded with secret veggies. And Egglands Best eggs are awesome, I love them them too! This looks absolutely delicious and I plan to make it soon. Won’t change a thing but the name …. shouldn’t this type of dish cooked inside the turkey be called stuffing and outside the bird called dressing? Could be just my Britishness … anyway can’t waitto try it. Your comment made me laugh because this is the age-old discussion! We have always, always called it stuffing in my house… regardless of whether or not it is stuffed into the bird. To me, they’re really the same!